House Indoril is one of the Great Houses of Morrowind. It governs the Indoril District in the heartland Morrowind from the capital city of Almalexia. Indoril District comprises the lands south of the Inner Sea and the eastern coast, including the city of Almalexia, and the town of Necrom with its City of the Dead. 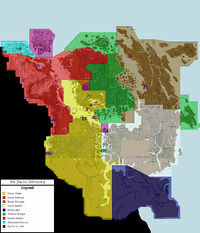 House Indoril has no territorial holdings on the island of Vvardenfell. To understand the Indoril we must understand Tribunate law, which is divided into two broad categories – the Laws Determined and the Laws Ordained. Ordained laws are the laws which can be broken, and which it is our moral responsibility not to break; it is the role of the Temple (and the Ordinators, which literally means "those who ordain") to guide us in these laws and to punish those who violate them. Determined laws are those laws which we cannot break, those which, by the will of the Tribunal, just are. These mean things like the laws of nature but also things like social hierarchies and precedencies that we think can be changed, but in the Indoril worldview are inviolable. Things like slavery. The Indoril are therefore all about the maintenance of law and order. They are a society of regulators. It is also a house in which actions are highly ritualized. Deviations from determined law are rigorously corrected and denied as incoherent. "The route along a pilgrimage requires crossing a particular bridge. The bridge has collapsed. Pilgrims continue to cross it – those who can levitate do, those who can't die." Determined law cannot be wrong, it's a contradiction in terms. There is a great deal of interpretation in understanding what determined law actually dictates, especially now that the Tribunal do not make appearances in public. Note: Tamriel Rebuilt has established background history to comply with the mod's lore. Rather than referring to a lore page, the background history of Tamriel Rebuilt's factions is presented on their own pages. Nerevar was born in the mid to late 1E 300s. He was a low-born Chimer, with no name, who became a mercenary and was very good at it. While he served as a spear-rider for a caravan led by a minor House Chimer and heading towards Mournhold, the capital, his caravan discovered one of the first Dwemer war centurions, which bore the mark of the Nordic kings. The caravan was divided between two sides: one wanted to bring it to Mournhold to show the council of House Fathers there what new weapons the Nords had, while another wanted to bring it to nearby wizards (proto-Telvanni) who would pay well for dwemercraft. Nerevar couldn't have a detour off their course for personal reasons – he was escaping debts, he had plans in Mournhold to set things straight. So when the caravaner decided to go sell the dwemercraft, he ended up killing the caravaner, stealing the dwemercraft, and riding off with the caravaner's banners. In Mournhold, he presented himself as a Chimer of the house of his banners. He met Vivec in the street. Vivec was not named Vivec then, but he erased his first name from the memory in the Red Moment so we don't know what he was called. At the court of the House Fathers, Nerevar met the others who would be his cohort: Sotha Sil, Dagoth Voryn, and Indoril Laesa. All four were younger and less experienced than Nerevar. He was sworn to House Dagoth as a master-at-arms to train Dagoth Voryn, their heir, and would eventually marry Indoril Laesa. At some point, members of the house he had been claiming to be arrived in Mournhold, revealed his lie, and demanded he pay for his crime. But now he was an Indoril by marriage, and they protected him; Nerevar couldn't be judged and made to pay like a lowborn, so if they wanted his blood they would have to declare a house war. The Chimer and Dwemer united in 1E 416 to liberate Dwemereth from the Nords. Nerevar became a general in the war and was ultimately declared as Hortator of the Chimer. After the war, he and Dwarf king Dumac formed a fragile peace and created the kingdom of Resdayn. The kingdom of Resdayn had peace for more than 200 years. There was significant technological advancement and everything was flourishing and great; this was the golden age of the Chimer. Dagoth Voryn ruined it by discovering the Earthbone research of Kagrenac and the Tonal Architects. They were messing with the fundamental laws of the universe and behaving like gods and the Chimer thought that very profane and wrong. Ultimately, the Chimer declared war and it lead to the Battle of Red Mountain. As they were being defeated on the battlefield, Kagrenac completed his experiment and the Dwemer disappeared to become the golden skin of the Anumidium. Only one Dwemer remained, Yagrum Bagarn, who had sacrificed his salvation so that he could hook the Anumidium up to the Heart of Lorkhan and the Dwemer could transcend reality. Unfortunately for the Dwemer, Nerevar and Voryn discovered the profane tools. Nerevar had Voryn guard them while he sought counsel from his other advisors, 'Vivec,' Sil, and Laesa. He returned to Red Mountain with them to discover that Voryn wouldn't give up the tools. There was a fight, Voryn escaped to eventually become Dagoth Ur the Sharmat, but Nerevar and his advisors took hold of the tools. Nerevar was going to destroy them, when his council killed him. Nerevar's shield-bearer, Sul Alandro, witnessed this. He was silenced hereafter, and by unknown means his mind was blasted into his chainmail headpiece. Then the Ashlanders got hold of it and Sul could possess their minds when they wore it, making them see what he did, or thought he did. And then, of course, this got scattered and spread among the tribes, so that eventually Ashlander tribes would all be wearing earrings made out of the chainmail ringlets, each one hearing the profane whisper of Truth. Sotha Sil activated the Dwemer tools and the Red Moment happened. The Chimer were transformed in the red-eyed, dark-skinned Dunmer. Nerevar's council became gods, Vivec took his new name, Laesa took the title Alma Laesa, which has been imperialised to Almalexia, and the reign of the Tribunal began. After the Proclamation of the Tribunal, a particularly zealous and devout group, many of whom had previously been the hand servants, secondary advisors, and shield-companions of the Tribunes in Their mortal history, set about proselytizing the newly ashened Dunmer and setting the order of Morrowind to right. This group included figures like Olms, Delyn, and Llothis. They regarded their actions as the continuity of the Second Council in keeping the laws of Morrowind; they regard Indoril Nerevar as the first leader of their house. This house came to dominate Morrowind by virtue of controlling the Temple and regulating the law. The Telvanni abandoned the rest of Dunmer society, and the Dres operated in stubborn heterodoxy on the Deshaan, so both of those houses were largely outside of the Indoril sphere. But in the rest of Morrowind, the Redoran guarded the border and the Hlaalu mediated Morrowind's relationship with outlanders, but the Indoril ruled. The Armistice which ended the second era cracked the Indoril's system. They declined in strength after the Armistice, when a great number of its nobles committed suicide, unable to accept Morrowind's new role as a province of the Third Empire. They weren't stubborn or arrogant, they just couldn't make sense of Morrowind losing its independence, because this was not consistent with determined law. The remainder of the house had a tough time adapting to the new situation, with all sorts of Dukes, Kings and a host of Imperial dignitaries being introduced to Morrowind's governmental structure, and the presence of Almsivi ever decreasing. 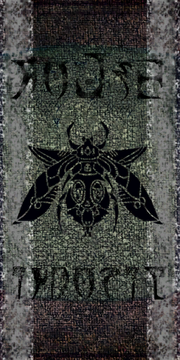 A flurry of exegeses were written to explain the Armistice in terms of determined law; these tended to present the situation in a way that maintained the Tribunal's total sovereignty over Morrowind. As the third era has progressed, the Indoril faith has been further shaken. Events are increasingly discordant with the laws of the Tribunal, and the Triunes themselves no longer appear in public. Hlaalu have taken authority over much of the territory that was once Indoril – all of it west of the Thirr. Things were looking bleak – they weren't even able to participate in the opening of Vvardenfell – until the last couple of decades, when Indoril has been under the strong leadership of Grand Ascendant Neril Sevuro, the brother of the Alma Rula and an experienced politician who reconciled the orthodox pacifists in the heartland and the traditional conservatives at the House's territorial borders, managing to muster a firm response to Hlaalu's expansionist policy and championing the House's true values. But he was already aged, and he's ill. Rumour is that he hasn't been seen outside his cloister in months. This page was last modified on 6 March 2019, at 07:49.